There's a big difference between a Scottish beat ghillie's role and that of a professional personal salmon guide. The next few paragraphs will focus in on exactly what the general roles of each are so you know what to expect and you don't turn up on a salmon beat with an inaccurate picture of things. A professional salmon beat ghillie who's employed by the salmon beat is there to offer all kinds of salmon fishing advice to his daily fishing guests and action a fair salmon pool rotation to all of his fishers. He is also there to be a great host to all fishing guests and an inspiration when the fishing is tough. Throughout the course of the morning and afternoon fishing sessions the professional beat ghillie will normally be out checking on his fishers at least a couple of times to make sure they are fishing correctly and to offer additional tactical salmon pool fishing advice if required. Aside from the above duties it is also the professional ghillie's role to keep the fishing hut clean and well maintained for his guest's and the kettle boiled for tea or coffee for the morning arrival of guests and at lunchtime too. It is also his responsibility to keep the riverbanks in good shape for ease of fishing purposes which can often mean the ghillie will out maintaining the riverbanks or painting the hut or boats during the Summer fishing months. The above factors do not leave much spare time for a professional ghillie who's running a busy salmon beat but it is important to know that a professional ghillie has the responsibility to look after everyone who is fishing and that means he'll usually be constantly on the move throughout the full course of the fishing day. A personal salmon fishing guide offers a completely different service which focusses attention solely on a group size of one or more guests. The personal guide will teach all the different salmon fishing tactical approaches from Spey casting techniques to effective riverbank movement if required and will stick solely with his party for the full fishing day. It is not a personal guides role to check on other fishing guests nor get involved in other salmon beat duties so a personal guide service offers a much more personal & comprehensive service than what a salmon beat ghillie can normally offer. A professional guide should have a good track record in salmon fishing and also be an excellent host. A personal salmon fishing guide service also includes all the appropriate salmon fishing equipment including waders, waterproof jackets, life jackets and the most appropriate proven salmon flies and lures. A personal guide's influence will go a long way towards the success of your salmon fishing day and should always be seriously considered if you or any of your party are in need of tactical tuition or constant professional supervision. When selecting a personal guide look for one with a proven track record who has ideally come from a full time career based background. If a Scottish salmon beat is not fully tuned into the 'client experience' or if the visiting salmon fishing client hasn't been correctly qualified by the agent with a view to understanding exactly what they need and expects from their salmon fishing trip then delivery issues will & do often occur. This industry has badly suffered from a lack of basic client qualification by agents and estates. A 'permit only' marketing focus has to date been the way the majority of salmon fishing has been sold in Scotland which has been very bad for client retention as new fishers don't get launched correctly or turn up ill equipped and soon loose interest in the sport. 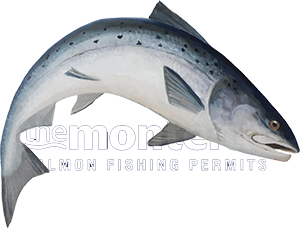 If you need a more 'comprehensive' salmon fishing service then it's important you consider booking a personal salmon fishing guide and don't just turn up at a salmon fishing beat with a permit thinking the beat ghillie will be able to offer the assistance or equipment that you or your party needs on the day.